Tesla is on the counter-offensive in Germany. After modifying its price structure to get access to the EV incentives in the country, now Tesla is responding to the critiques of the German road authorities about Tesla’s use of the word ‘Autopilot’ to describe its advanced driver assistance system (ADAS). The company ordered a third-party survey of its owners in the country to determine whether or not they understand Autopilot. Tesla’s initiative comes after the German Transport Ministry called the Autopilot a “significant traffic hazard” and sent a letter to all Tesla owners in the country to give them instructions on how to use the system, like to keep their hands on the wheel and their eyes on the road. The main concerns were not about the performance of the system, but what the Minister describes as a potential danger of the name ‘Autopilot’ encouraging drivers to think they don’t need to monitor the vehicle. 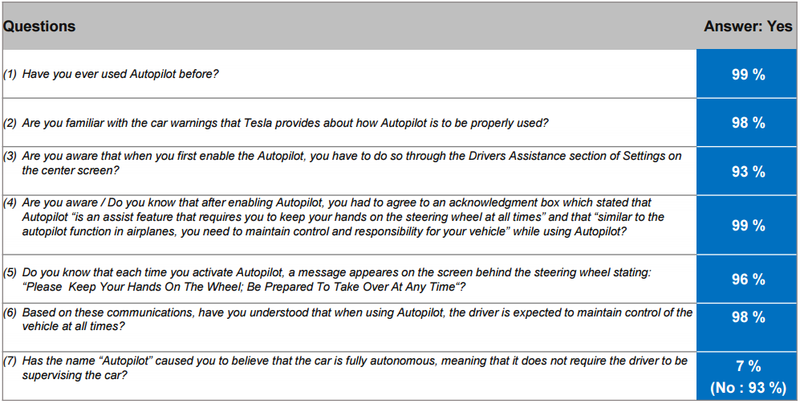 Now Tesla’s survey aimed to prove that owners know how to use the Autopilot and what it means. A significant majority of german Tesla customers understand the meaning and functions of the Autopilot. On the one hand they are aware of the car warnings that Tesla provides, on the other hand the customers also know that they have to keep control over their car. Different to what is heard in the media, Tesla owners absorb the information that appears on the center screen of the car. Besides that the name “Autopilot” did not cause the customers to believe that the car is fully autonomous. Based on the warnings about 98% of the current Tesla owners understand to maintain control of the vehicle at all times.